Kettering Town have signed the former Sunderland, Huddersfield and Northampton Town forward Martin Smith on non-contract terms. The 35-year-old, who most recently played for Blyth Spartans in 2008, made his debut for the Poppies in the 0-0 draw with Darlington. 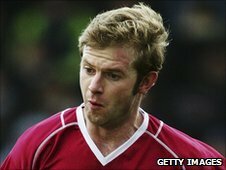 "He looked a little off the pace, but he's not played in a long time," boss Lee Harper told BBC Radio Northampton. "He did put in one ball that we should've really scored from." Smith also counts Sheffield United and Darlington amongst his former clubs. Harper believes his team is now close to being at full strength. "We've got decent forwards and, with another week's training, Moses Ashikodi will be up to speed," he said. "We want to be a team that's exciting for the fans whilst being tight at the back. "We've kept two clean sheets in three matches and only conceded once from open play. The emphasis now is to improve offensively, either by bringing in new players or swapping things around."